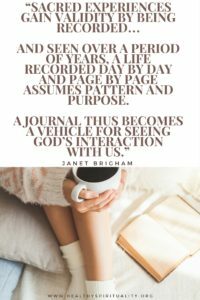 Are you just beginning to write in a spiritual journal? I have a friend who is starting the spiritual practice of writing in a spiritual journal and she asked me recently for some beginner tips. I thought I would share what I told her as it may help someone else. I wrote a four-week series on writing a spiritual journal in June and you many find it useful to reread those words. Date your work – you will be amazed on how quickly times flies when you reread your words and amazed at what changes and what stays the same. The dates ground your reality. Use any type of journal and feel free to experiment with different formats. I keep coming back to smaller lined journals that you can find anywhere, but have tried three-ring notebooks with divided sections, apps on my phone, and bullet journals. Write anything but always keep in mind that someday someone may read your words. When I write I knowingly know my kids and grandkids may read what I wrote but will say I am 99% honest in what I share. I have also written little notes to them to find at some future date. One of my most precious possessions is the 60 years of dairies kept by my great aunt Anna and I am hoping my spiritual journals will be cherished by future generations too. Writing in a spiritual journal is a form of prayer for me. What am I praying for? What am I most grateful for? Struggling to find the right word, writing out something and realizing the depth and at times anguish in an experience, discerning back and forth a decision, recording special quotes, verses and inspiration, notes from retreats and conferences, and just plain talking with God fills the pages for me. Write out what you are observing, hearing, tasting, reading, dreaming, risking. Pay attention and record your daily life. Just write. Don’t edit. 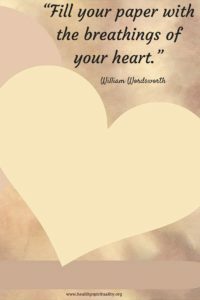 Let your heartfelt thoughts flow. Make it yours. I’ve added clippings from magazines, blog sites and even writing from my own blog to the pages. One of the best activities I did was assigned during an online retreat: We were to find a picture of ourselves when we were young and write about: What do we see when we look at that photo? 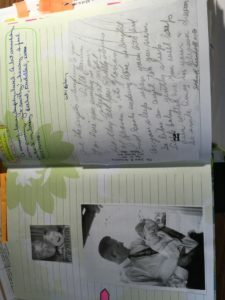 I copied several of photos to tape into my journal. The most powerful one was finding an old photo of my dad holding me as a baby. To my surprise, I also found a poem/prayer he wrote for me. Don’t worry – just write. If you miss for awhile, don’t fret – just start again. My journal writing is hit and miss, but ends up about weekly to every other week. Find your own pattern and write. Writing a spiritual journal is a wonderful life-giving spiritual practice. Let’s talk. If you write in a journal, how has this practice brought you closer to God? If you don’t keep a journal, what is your biggest obstacle to writing one? A spiritual journal is a great way to track how you are growing spiritually. This type of journal is different from the traditional journal or diary. A spiritual journal can aid you in becoming who you wish to be. Focus on Spirituality. I figured you would be one to write a spiritual journal. Some people really resist them yet I find this such an essential practice for me. I’m relatively new to spiritual journaling, except for recording blessings (since 1983) and writing in response to Bible study reflection questions. But I’m learning that just as two-way communication fosters human relationships, the same holds true for spiritual relationships, even when One Person does not speak audibly! As I record inner impressions that seem to come from my Father, I feel intimacy with him growing. Sometimes, as I begin to write, I’m not sure what will come out of my pen. But when the words become sentences of inspired instruction or encouragement, it’s like a holy hug from heaven! Thank you, Jean, for teaching us about this vitalizing discipline. I really was inspired by your series in June to start a spiritual journal. Have I yet? No, but I do get so much satisfaction when I write posts for my blog, as I feel I’m in direct communication with God at those times. I haven’t given up on the idea of a journal, though. Thanks for prodding me on, Jean! Blessings! I really think blogging is the cousin to journaling. I have often copied a post and taped it into my journal – so you are probably doing more journal writing than you think you are. Stay open – the best time and place will bubble up at the perfect time.